When we think of the Progressive Era we usually think of Theodore Roosevelt, Robert LaFollette, muckrakers and the like. This book reminds us that Woodrow Wilson was among “the like.” Just at the time when the Republican Progressives were “purged” in the 1910 elections, Woodrow Wilson was establishing a reputation as a progressive Governor of New Jersey. “Woodrow Wilson and the Progressive Era” begins with a comparison of and contrast between Theodore Roosevelt’s New Nationalism and Wilson’s New Freedom, followed by an in-depth study of the Wilson program.The 1912 election was a four way contest between Progressives Roosevelt and Wilson, Conservative, but self-proclaimed progressive, President William Howard Taft and Socialist Eugene V. Debs. Author Arthur Link does a good job in examining the voting patterns which showed that the one party that gained votes was the Socialist, which reached its electoral high water mark. The conventions of both traditional parties were struggles between conservative and progressive elements, with the conservative Taft prevailing in the GOP but the progressive Wilson winning an extended contest in the Democracy.Once in the White House, Wilson shepherded a legislative program that included establishing the Federal Reserve System, which Prof. Link demonstrates as a negotiated compromise between the Hamiltonian Bank of the United States tradition and the Jacksonian anti-bank position.The chapters that I found to be most surprising, and therefore most interesting, were those dealing with foreign policy, particularly the intervention in Mexico. I had always thought that Gen. Pershing was sent after Pancho Villa in response to his border raids into Texas. As this book clearly establishes, the Wilson Administration had been deeply involved in trying to broker and pick winners in the civil war then tearing Mexico apart. I was shocked to learn how deeply the U.S. was entangled in that morass. These sections generate comparisons in the reader’s mind to later interventions in Korea, Vietnam and current ones in Iraq and Afghanistan. At times it appeared likely that there would be a second Mexican War, which would have impacted American involvement in World War I, either because of resources committed South of the Border or by forcing an earlier mobilization that may have given America a more decisive impact when it did go “Over There.” In the context as outlined in this book, the Zimmerman Telegram, in which Germany offered to aid Mexico in regaining its “Lost Territories”, is seen as a logical extension and exploitation of a festering wound rather than a gratuitous invitation for Mexico to become involved in a struggle not its own. The rise of the Progressive Pacifists, for a time allied with Wilson, in opposition to Progressive Interventionists sheds light on the bitter conflict between Wilson and TR.“Woodrow Wilson and the Progressive Era” is well organized and skillfully written. It is an in-depth study written in popular language, enhanced by appropriate pictures and editorial cartoons. I have made a point of studying the Progressive Era and find this work to be a valuable resource in that pursuit. A self-righteous restatement of the liberal conventional wisdom from 1954. A basic "progressive good, conservative bad" book. Since no reasonable person could disagree with Progessivism there's no reason to examine both sides of an issue too closely. Good people think one way, bad people think another and who cares what the bad prople think? The author writes in the spirit of a joyous pom-pom girl at a homecoming game, although at some points I think he may have gone into a swoon over his hero. Arthur Link's history presents a somewhat satisfying explanation for America's entry into WWI using a "traditional" methodology. By studying the foreign policy of the Wilson administration within the context of its domestic policy, Arthur Link explains why official America was so hesitant to embark on a war in Europe. The Progressive movement, which Link demonstrates often moved ahead of the president, stood for social reform at home but was divided between Theodore Roosevelt's Republican Progressives and Wilson's Democratic wing. Electing a Democratic Progressive candidate in 1912 and 1916, the American populace expected domestic reform and in the latter case abstention from Europe's conflicts. Link concentrates on periodical literature to glean the texture of popular sentiment. For official policy, he makes extensive use of source materials but does not refer extensively to the opinions of other historians. The former tends to neglect the intellectual and cultural context of popular sentiment, the later has the weakness of glossing over interpretive controversies. Concentrating on Woodrow Wilson and his circle of advisors presents a limited view of American entry into the war, but these are the most significant figures in the long run. Despite recent criticism, the history of high politics is still the stuff of American foreign policy and diplomacy. A traditional approach to the history of America's response to the Mexican Revolution and entry into WWI still has much to offer. This 1954 history goes in depth on the politics of Wilson's first term as president, and then a couple months later into the decision to go to war on the side of the Allies. As late as January, 1917, it was plausible that things might have been different, and Wilson could have found himself pushing to join the German side in WWI. Link, writing at a time when these events were in living memory, follows the twists and turns of political fortunes and Wilson's mindset. The many progressive accomplishments in that first term were a result of fulfilling campaign promises used to beat Roosevelt in 1912 (when Wilson was gifted with a huge Democrat majority in both houses of Congress) and a veer leftward to help win re-election in 1916. I never realized that the graduated income tax really took effect only in an effort to pay for war preparedness. I wasn't at all aware of the constant fluctuations in the Mexican revolutions of that period - just a vague sense that they happened and that Germany was interested in joining with Mexico against the U.S. Wilson did not seem to be planning for war while running as a peace candidate (something different from Franklin Roosevelt's later policies in a similar situation) and the country was going through a wild series of angers and calmness during the first three years of the Great War. Fascinating to compare this with the book I read a couple weeks ago on a similar time period, which included much more sociology and culture discussions, and way less detail on the politics. 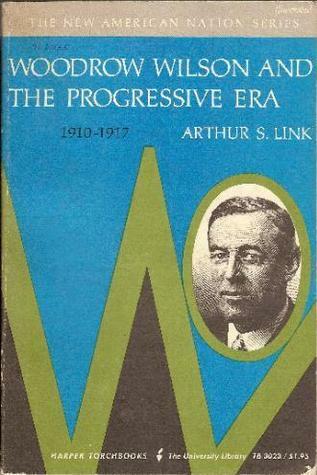 Arthur S. Link - A graduate of the University of North Carolina at Chapel Hill, Arthur Stanley Link was a longtime historian specializing in Woodrow Wilson and the Progressive Era. Link taught for most his career at Princeton University, with the exception of an 11-year interval he spent at Northwestern University. The author of 30 books, he is most notable for writing an incomplete multi-volume biography of Wilson and editing the 69-volume Papers of Woodrow Wilson.